Do you fancy a nostalgic trip back to Waihōanga, or want to scope a new event (a wedding maybe or a significant birthday?) or want to show this special place to friends.. or maybe you just like the idea of a drive up the Kāpiti Coast and spending some time with good people beside the river. 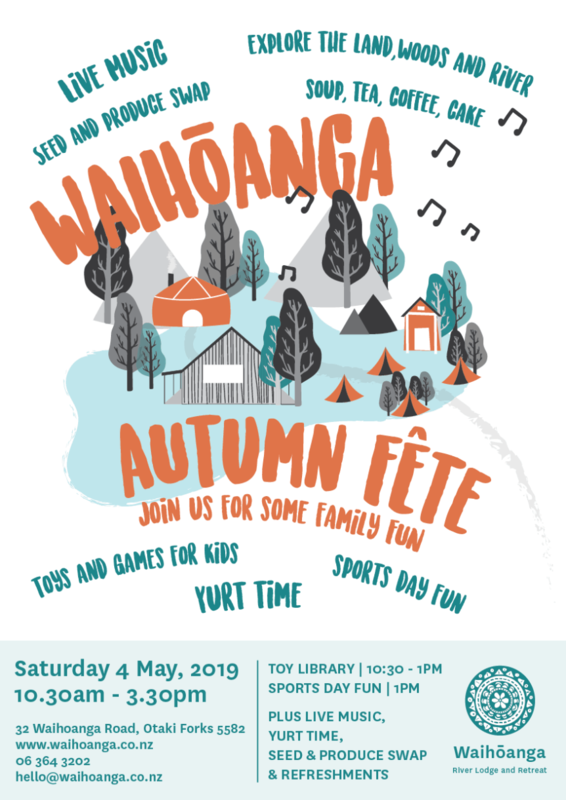 Please join us, Saturday May 4th, 2019, 10:30am – 3:30pm, for our first Waihōanga Autumn Fete. A family friendly day with toys and games for kids, yurt time, live music, a seed and produce swap, and that all important sports day fun (think egg and spoon races, potato sacks, apple bobbing…). Also a great chance to meet some of the people who work here – responding to your emails, keeping the land beautiful, and creating delicious meals. Directions to Waihoanga (PDF) – download this before you set off!